The movement of sediment and associated pollutants over the landscape and into water bodies is of increasing concern with respect to pollution control, prevention of muddy floods and environmental protection. In addition, the loss of soil on site has implications for declining agricultural productivity, loss of biodiversity and decreased amenity and landscape value. The fate of sediment and the conservation of soil are important issues for land managers and decision-makers. In developing appropriate policies and solutions, managers and researchers are making greater use of erosion models to characterise the processes of erosion and their interaction with the landscape. A study of erosion requires one to think in terms of microseconds to understand the mechanics of impact of a single raindrop on a soil surface, while landscapes form over periods of thousands of years. These processes operate on scales of millimetres for single raindrops to mega-metres for continents. Erosion modelling thus covers quite a lot of ground. 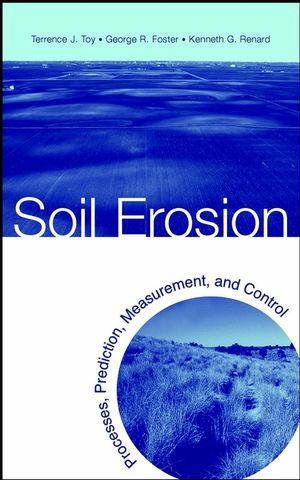 This book introduces the conceptual and mathematical frameworks used to formulate models of soil erosion and uses case studies to show how models are applied to a variety of purposes at a range of spatial and temporal scales. The aim is to provide land managers and others with the tools required to select a model appropriate to the type and scale of erosion problem, to show what users can expect in terms of accuracy of model predictions and to provide an appreciation of both the advantages and limitations of models. Problems covered include those arising from agriculture, the construction industry, pollution and climatic change and range in scale from farms to small and large catchments. 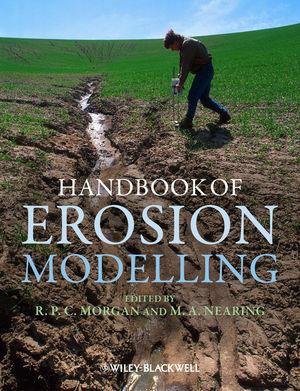 The book will also be useful to students and research scientists as an up-to-date review of the state-of-art of erosion modelling and, through a knowledge of how models are used in practice, in highlighting the gaps in knowledge that need to be filled in order to develop even better models. Roy Morgan is Emeritus Professor at Cranfield University, Bedfordshire, UK. His research interests cover soil erosion processes, the role of vegetation in soil erosion control and soil erosion modelling. He was involved in the development of EUROSEM (the European Soil Erosion Model). He is a Past-President and Honorary Member of the European Society for Soil Conservation and the author of Soil erosion and conservation (3rd edition, Blackwell 2005). Dr Mark Nearing has authored more than 200 scientific papers on the subject of soil erosion over the past 25 years. He is Past President and serves on the Board of Directors of the International Soil Conservation Organization and has organized and presented keynote presentations at numerous international meetings. 2 Model Development: A User's Perspective (R.P.C. Morgan). 3 Calibration of Erosion Models (V.G. Jetten and M.P. Maneta). 4 Dealing with Uncertainty in Erosion Model Predictions (K.J. Beven and R.E. Brazier). 5 A Case Study of Uncertainty: Applying GLUE to EUROSEM (J.N. Quinton, T. Krueger, J. Freer, R.E. Brazier and G.S. Bilotta). 6 Scaling Soil Erosion Models in Space and Time (R.E. Brazier, C.J. Hutton, A.J. Parsons and J. Wainwright). 7 Misapplications and Misconceptions of Erosion Models (G. Govers). 8 Universal Soil Loss Equation and Revised Universal Soil Loss Equation (K.G. Renard, D.C. Yoder, D.T. Lightle and S.M. Dabney). 9 Application of WEPP to Sustainable Management of a SmallCatchment in South west Missouri, US, Under Present Land Use and with Climatic Change (J.M. Laflen). 10 Predicting Soil Loss and Runoff from Forest Roads and Seasonal Cropping Systems in Brazil using WEPP (A.J.T. Guerra and A. Soares da Silva). 11 Use of GUEST Technology to Parameterize a Physically-Based Model for Assessing Soil Erodibility and Evaluating Conservation Practices in Tropical Steeplands (C.W. Rose, B. Yu, R.K. Misra, K. Coughlan and B. Fentie). 12 Evaluating Effects of Soil and Water Management and Land Use Change on the Loess Plateau of China using LISEM (R. Hessel, V.G. Jetten, B. Liu and Y. Qiu). 13 Modelling the Role of Vegetated Buffer Strips in Reducing Transfer of Sediment from Land to Watercourses (J.H. Duzant, R.P.C. Morgan, G.A. Wood and L.K. Deeks). 14 Predicting Impacts of LandUse and Climate Change on Erosion and Sediment Yield in River Basins using SHETRAN (J.C. Bathurst). 15 Modelling Impacts of Climatic Change: Case Studies using the New Generation of Erosion Models (J.P. Nunes and M.A. Nearing). 16 Risk-Based Erosion Assessment: Application to Forest Watershed Management and Planning (W.J. Elliot and P.R. Robichaud). 17 The Future Role of Information Technology in Erosion Modelling (D.P. Guertin and D.C. Goodrich). 18 Applications of Long-Term Erosion and Landscape Evolution Models (G.R. Willgoose and G.R. Hancock). 19 Gully Erosion: Procedures to Adopt When Modelling Soil Erosion in Landscapes Affected by Gullying (J.W.A. Poesen, D.B. Torri and T. Vanwalleghem). 20 The Future of Soil Erosion Modelling (M.A. Nearing and P.B. Hairsine).